After teasing the song for weeks, the rapper has finally dropped the YouTube exclusive. Young Thug seems to have shaken some of the demons he grappled with in "Safe," an emotional ballad dropped back in February. The rapper is back with another YouTube-exclusive song and video called "All The Time." The song, produced by Bricks Da Mane and Narcos, is a sharp change from the darker message of "Safe." Set in a mansion filled with designer luggage, women, cars, a pool, and stacks of money, the video for "All The Time," directed by DAPS, puts Thugger back into his element. 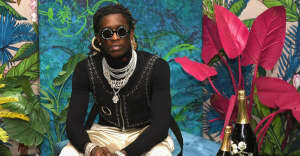 But the Atlanta rapper wouldn't be Young Thug if he didn't brave something new for his art — throughout the video, he appears to be holding several live snakes with ease and comfort.